ZURICH -- FIFA vice presidents Juan Angel Napout and Alfredo Hawit were arrested Thursday as part of the U.S. Department of Justice's widening bribery case that has rocked soccer's scandal-hit governing body. Both men have opposed their extradition to the United States at Zurich police hearings, Switzerland's justice ministry said in a statement. 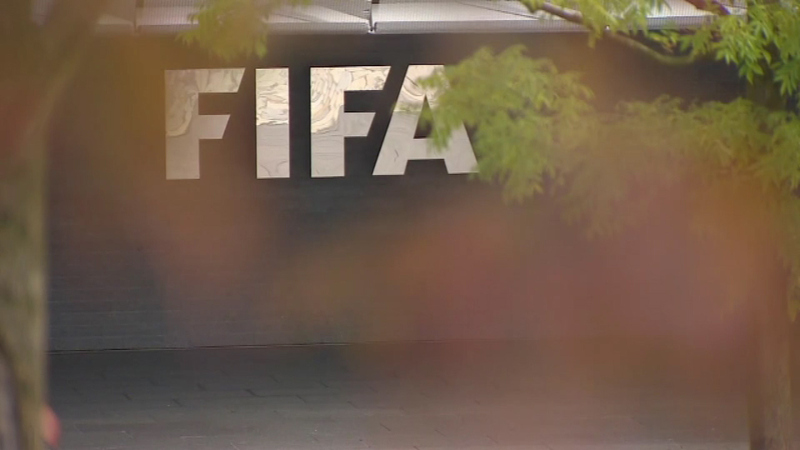 Hours earlier, Swiss police made pre-dawn raids at the luxury Baur au Lac hotel in downtown Zurich, the same place where arrests on May 27 sparked the FIFA corruption crisis. "According to the U.S. arrest requests, they are suspected of accepting bribes of millions of dollars," the justice ministry said. "Some of the offences were agreed and prepared in the USA. Payments were also processed via U.S. banks." The bribes are linked to marketing rights for the Copa America - including the 2016 edition hosted in the United States - and World Cup qualifying matches. Napout, who is from Paraguay, is president of the South American confederation and Hawit, who is from Honduras, leads the North American regional body known as CONCACAF. They are the third past or current presidents of each continental body to be indicted by the U.S. Department of Justice since May in a case that has shattered the reputations of soccer leaders in Latin America. "CONCACAF continues to cooperate with all government authorities in their investigations to the fullest extent," the Miami-based governing body said in a statement. It is a further strike by the DoJ at the heart of FIFA ahead of a key meeting of soccer's international leaders. The arrests were made ahead of a 9 a.m. (0800 GMT) FIFA executive committee meeting which approved wide-ranging reforms to help protect against corrupt officials. The reforms are a response to the dual American and Swiss federal investigations of corruption implicating FIFA leaders and which forced President Sepp Blatter to announce his resignation plans in June. Fernando Sarney, a FIFA executive committee member from Brazil, said the arrests tainted what was intended to be a milestone day for the governing body to show it was committed to changing its culture. Modernizing changes supported Thursday include taking many decision-making powers from the executive panel, to be renamed the FIFA Council, with more men and women members. Future presidents and council members will be limited to 12 years in office. FIFA's 209 member federations must vote on the changes on Feb. 26. "It was like someone had died, that was the atmosphere inside,' Sarney told reporters after the meeting. "Everybody was surprised, the feeling was like it's happening again, that it's something we think is personal." On May 27, the U.S. Department of Justice named two more FIFA vice presidents - Napout and Hawit's predecessors, Eugenio Figueredo and Jeffrey Webb, respectively - among 14 soccer and marketing officials indicted. They were linked to bribes worth tens of millions of dollars for the Copa America and other regional tournaments in South and Central America. Four other men made guilty pleas. FIFA interim President Issa Hayatou - who stepped in when Blatter was suspended from duty by FIFA in a separate case of financial wrongdoing in October - was due to give a news conference at 2 p.m. Swiss time (1300 GMT). U.S. Attorney general Loretta Lynch was also due to brief media in Washington later Thursday, with more international soccer officials likely to be indicted. The arrests Thursday follow increased activity in the FIFA bribery case in recent weeks, with South American soccer leaders targeted. FIFA executive committee member Luis Bedoya of Colombia resigned his position last month. Colombian prosecutors said they are investigating financial transactions by Bedoya and requested information from U.S. authorities. Chilean soccer federation president Sergio Jadue resigned also last month and traveled to Miami, amid media reports he was cooperating with U.S. investigators. The indictment published in May said most presidents of the 10 South American federations would receive $1.5 million in bribes from marketing company Datisa from each of four editions of the Copa America being played from 2015 through 2023. The last six months have been the most turbulent period of Blatter's 17-year reign as FIFA president. The Swiss official was re-elected as FIFA president on May 29, two days after a raid in Zurich by Swiss police resulted in seven officials being arrested and criminal proceedings being opened regarding "systematic and deep-rooted" corruption in soccer. As a result of the Swiss investigation, Blatter and UEFA President Michel Platini are currently serving 90-day suspensions amid FIFA ethics investigations involving $2 million of FIFA money Blatter approved for Platini in 2011 as backdated salary. Both face lifetime bans at ethics hearings expected this month.